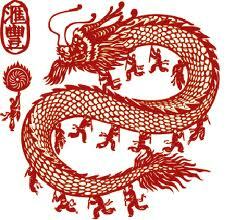 Those are a few of the qualities attributed to the dragon, the symbol for the year 2012 in China. Like most people I am fascinated by dragons and was especially interested in their use and symbolism when I was in China. In that ancient civilization the dragon has long been used in conjunction with the Emperor, and thus is considered to be the symbol absolute strength and power. As opposed to the European depiction of dragons as evil and destructive, Chinese dragons traditionally connote potent and auspicious powers, and Chinese legend holds that that China's first Emperors, Yandi and Huangdi, were both related to the Chinese Dragon. Other legends tell of a peasant born with a dragon birthmark who eventually overthrew the reigning dynasty and himself became Emperor. Whether we currently feel like our status is that of peasant or head of state, we can find within ourselves our own unique forms of power, strength and good fortune. And not just for 2012. If we take a moment at the end of any given day to look back on what transpired, we may very well be pleasantly surprised at all the ways we expressed qualities desirable in an Emperor... such as patience, wisdom, care for the people in your realm, decisiveness, fearlessness, confidence, strategic long-term planning etc. These are attributes we can make our own regardless of birthright, astrological sign, our living & work environments or the economy. Each day affords us the opportunity to embrace our own inner dragon and use our strengths to bless those in our world. May the dragon in you reign on this auspicious day and every day to come. Happy Chinese New Year, dragonheart.